Investing isn't just for the top 1%. 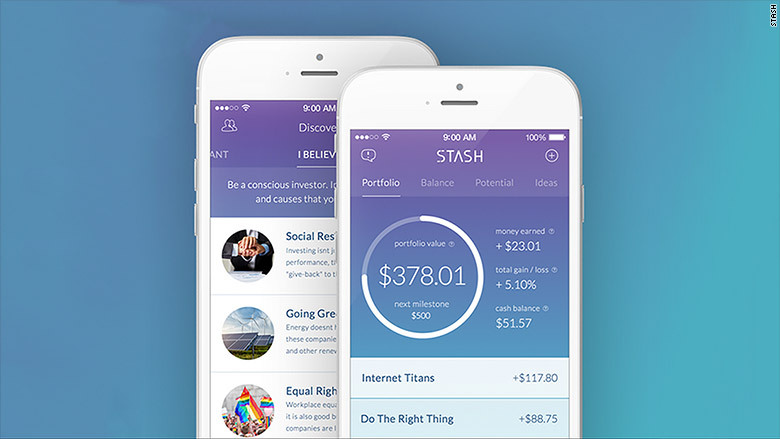 A new app called Stash that launched today allows people to invest for as little as $5. It's the latest app trying to make investing simple -- and accessible -- to everyone. "The idea for Stash came from the weight-loss industry -- make it easy to take a small step," says David Ronick, one of the co-founders of Stash. New investors often get overwhelmed by all the options. There are thousands of stocks and funds to invest in. Stash decided to make it easy -- you get to pick from 30 funds. Users choose from funds such as "Clean & Green," "American Innovators" or "Global Citizen." All of the funds available on Stash are actually ETFs run by well-known investment firms like BlackRock (BLK), Vanguard and Charles Schwab (SCHW). What Stash does that's different is it explains in plain English what you're investing in and it allows you to only invest a few bucks at a time instead of having to wait until you have $100 or $1,000. The key question to ask with any investment is what the fees are. Stash charges $1 a month for balances under $5,000. The fee is meant to be low enough to encourage people to give investing a try. "We want to make it easy to start and then encourage people to keep investing," says Ronick. However, it's important to note that if you're only investing $5, you would quickly have your money eaten up by the fees. People who have over $5,000 invested through the app are charged a 0.25% fee a year. In addition to simplifying the investment process, Stash also functions as a financial advisor. When people sign up for the app, they answer a few questions -- it's meant to take about two minutes -- to get a sense of whether they are a conservative, moderate or aggressive investor. Stash then recommends investments to meet your needs. Stash says that 50,000 people signed up for the waitlist. That should serve as a reminder to the financial world that there's ample demand for simple and cheap investing apps, especially from Millennials. A number of apps have launched in the past year or so to meet the demand from young people. One of those is Acorns, which encourages people to invest the change they get when they buy a cup of coffee or bagel sandwich. Then there's Robinhood, a trading app that allows investors to buy and sell stocks and ETFs for free. Robinhood allows you to start trading for as little as pennies, but the catch is that you have to be able to afford the stock you are buying. A stock like Apple (AAPL) currently costs $110 a share, while eBay (EBAY) is $24. Stash allows investors to essentially purchase fractions of ETF shares. That's how it's possible to invest just a few bucks at a time. Only one stock is available on Stash. It's the "Roll with Buffett" option, which buys shares (or fractions of shares) of Warren Buffett's company Berkshire Hathaway (BRKB).